All known stellar-mass black holes (and candidates) are found in a binary system with normal stars. It is this association that allows us to infer the presence of these black holes. To date 20 systems are known to contain bodies too compact to be neutron stars. There are also another 20 systems with black hole candidates. However, vital information about these systems has yet to be determined (Bemillard and McClintock 2006.) Since about half of stars are contained in binary systems there is likely to be many more. Other types of black holes include super-massive and intermediate-mass black holes. Super-massive black holes have been found at the centre of our galaxy and other large galaxies (COSweb.) Intermediate black holes are thought to exist and are of a mass between stellar-mass and super-massive black holes. Primordial black holes are hypothetical objects are thought to have resulted from the big bang. These objects are beyond the scope of this essay. X-ray emitting binary systems containing black holes can be divided into two classes (CAMBweb): high mass x-ray binaries (HMXB) and low mass x-ray binaries (LMXB.) HMXBs contain optical members with masses greater than 10 solar masses (NOVAweb.) They form when the larger of stars in the binary system reaches the end of its life resulting in a supernova and the remnants being of more mass than the limits of a neutron star (NOVAweb.) The remaining visible star is a O or B class star. As the smaller star nears the end of its life it enters the red giant stage with mass transfer taking place. This is known as the HMXB stage. 1) Initial system with 2 stars in binary system. 2) The larger star approaches the end of its life and becomes a red supergiant with the smaller star capturing gas from it. 3) The larger companion’s life ends resulting in a supernova. 4) As the remnant of the star is greater than 3 solar masses so a black hole forms. 5) The black hole captures solar wind and gas from the remaining star. 6) The star reaches the end of its life and becomes a red giant. This results in an increased rate of mass transfer. 7) The remaining star forms a supernova at the end of its life. 8) If the remnant of that star is greater than 3 solar masses it will form a black hole. LMXB systems consist of a body the same mass as our sun or less and a black hole (or other compact body, see fig 3.) 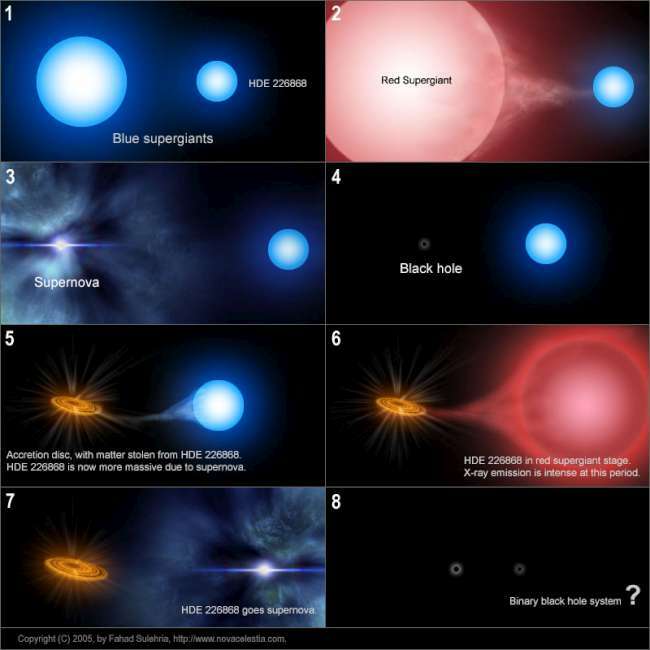 The origin of the low mass x-ray binary systems is less clear and may be the result of a black hole capturing a star (CAMBweb.) These systems result in a slow mass transfer and x-rays being emitted periodically in bursts. There are three properties that a black hole may possess. They are mass, electrical change and spin (Freedman and Kauffman p 594-596.) None of these properties can be detected directly from a remote location. It is important to determine the mass of the compact body as it is an important indicator of what the object is. The effect that mass has on other bodies can be determined. The gravitational effect that a black hole has on nearby bodies is a significant tool available to astronomers. If we can determine the mass of the optical member and the orbital period of the binary it is possible to calculate the mass of the unseen partner in the system. To achieve this we can use our knowledge of the association between spectral type and stellar mass and use Newton’s form of Kepler’s third law to determine the mass of the compact body. The difficult part of determining the mass of the black hole from Kepler’s third Law is determining the radial velocity. As these systems can not be resolved optically we must rely on other methods. One of these methods is to investigate the spectroscopic change in the optical object due to blue-shift (as the star move towards us) and red-shift (as it moves away.) To be most effective the plane of the orbit needs to be directed towards the observer (LaSala, Charles, Smith et al, 1998.) This method can determine orbital period but may also be used to determine radial velocities. However, only the velocity towards and away from the observer can be calculated. Therefore, unless the plane of orbit is directed towards the observer, the measured velocity will not be its true velocity. As such only the minimum mass of the compact body can be determined if the orbit plane is inclined. If the accretion disk is eclipsed by the normal star it is possible to determine the angle at which the orbital plane is inclined (ASTROweb.) In this case a more accurate radial velocity can be determined. An important indicator that a compact body is a neutron star rather than a black hole is the presence of x-ray busters. X-ray bursters occur when gas from the companion star deposits gas onto the surface of the neutron star (Freedman and Kauffman p 571-572.) As the newly arrived hydrogen is converted to helium it is deposited onto the surface of the neutron star. Once the layer is about 1 metre thick the temperature can increase enough to cause helium fusion. The result is a short lived thermonuclear flash that fades in seconds. As a black hole does not have a surface this can not happen. Therefore, if x-ray bursters are present in a system a neutron star must be present. Some systems containing compact objects have spectra signatures indicating that the compact object is a neutron star. As the material from the accretion disk mixes with the atmosphere of the neutron star the resultant energy state changes should be reflected in the black body radiation of the neutron star (ASTROweb.) This can be used to disprove a black body candidate if the signature is present. The case of Cygnus X-1 is worth detailing as it highlights may of the techniques used be astronomers to detect black holes. In 1971 the Uhuru x-ray satellite detected an x-ray source unlike those known to astronomers at the time (Freedman and Kauffman p 586-587.) This new source was highly variable with changes measure in the hundredths of a second. This interested astronomers as any ‘flickering’ can not be quicker than the time for light to cross the object. The implication was that the body was less than 3000km across. Figure 2 shows a model of the development of this system. Soon afterwards it was discovered that Cygnus X-1 periodically emitted bursts of radiation in radio frequencies. This radiation came from the same place in the sky as the star HDE 226868. Spectroscopic investigations found that HDE 226868 was a B0 class star which do not emit x-ray radiation. Another part of the puzzle came from the periodic Doppler shifting of the light from HDE 226868. The period of the shift was at 5.6 days. This type of periodic shifting is indicative of binary system (LaSala, Charles, Smith et al, 1998) Due to the information gathered about HDE 226868 it is thought that the star has of about 30 solar masses. Given this mass and the orbital period (with use of Newton’s form of Kepler’s third law) the invisible companion of HDE 226868 is 7 solar masses or more. The maximum limit of a neutron star is about 3 solar masses (Bemillard and McClintock 2006) so the invisible partner must be a black hole. This system is likely to contain a 16 solar mass black hole (ASTROweb.) The presence of radio emissions and a lack of negative indicators of a compact body surface reinforces the conclusion that this system contains a black hole. Binary star systems containing stellar-mass black holes are varied and the distinction between a black hole and a neutron star within a system can be tricky to determine. However, we have found that it is possible to gain enough information to be fairly sure that what we see is the result of a stellar-mass black hole. Since most stars that we observe are contained in binary systems it is likely that many more stellar black holes are still to be located. Freedman, R. A. & Kaufmann, W. J, III. 2007, Universe , 8th ed. ; New York: W.H. Freeman & Co.
Remillard, R A and McClintock J E. 2006. Preprint arXiv: astro-ph/0606352v1.